Ivanhoe was settled in the 1890s by German immigrants and was built out through the 1930s by middle-class and working-class white families. However, the Brown vs. Topeka Board of Education decision to integrate schools initiated the steady migration of white families to the suburbs. By the 1980s and 90s, the Ivanhoe neighborhood was marked by drug houses, crime, falling property values and continued decline in population. The renaissance of the neighborhood came in 1997 when resident Alan A. Young and his wife, Yolanda, took the lead in organizing prayer vigils that resulted in the closing of six drug houses and the reinvigoration of the Ivanhoe Neighborhood Council. A strategic plan to revive Ivanhoe to thrive once again was developed; funding has followed and today Ivanhoe is widely considered one of the strongest neighborhood associations in the city. June 13, 2016 / Ribbon-cutting ceremony for the Ivanhoe Gateway at 39th. 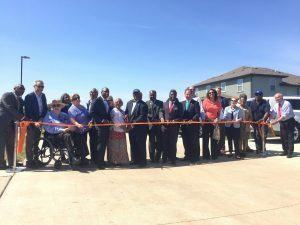 Three duplexes (six units) and 12, one-story senior cottages kick-off the three-phased development project focused on the 3800 blocks of Euclid and Garfield.